We’ve talked before about not settling for mere competence in your writing. We’ve already got plenty of that. The “tsunami of content” available for the consumer of fiction today is made up largely of a spectrum that ranges stink bomb to okay, with the scale tilted decidedly toward the former. It has ever been so, according to Sturgeon’s Law. So if you want word-of-mouth, and delighted readers, you’ve got to bring something extra to the page. Today I want to talk about adding snap to your style. As an example of how to do it, I turn us back to another tsunami, the boom in mass market paperback originals from the 1950s. The public, just beginning their addiction to television, was still voracious in its reading habits. Drugstore spinner racks had to be replenished daily with new titles from such publishers as Gold Medal and Pocket Books. As a result, noir and crime and mysteries were cranked out by scores of writers, accompanied by racy covers and taglines such as: An isolated mountain lodge—and open season on SIN! and She had the face of a madonna and a heart made of dollar bills! Most of this fiction was serviceable. It did its job and was soon forgotten. But within this market there emerged some fine, even great writers. The ones who stood out always gave their fiction something extra, usually in the style. John D. MacDonald was one. Another was Gil Brewer. Despite some lurid titles – Hell’s Our Destination, And the Girl Screamed, Little Tramp, The Brat, The Vengeful Virgin– Brewer’s fifties GM [Gold Medal] and Crest novels are neither sleazy nor sensationalized; they are the same sort of realistic crime-adventure stories John D. MacDonald and Charles Williams were producing for GM, and of uniformly above-average quality. Most are set in the cities, small towns, waterways, swamps, and backwaters of Florida, Brewer’s adopted home. …The protagonists are ex-soldiers, ex-cops, drifters, convicts, blue-collar workers, charterboat captains, unorthodox private detectives, even a sculptor. The plots range from searches for stolen gold and sunken treasure to savage indictments of the effects of lust, greed, and murder to chilling psychological studies of disturbed personalities. 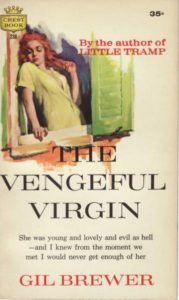 Hard Case Crime has re-published The Vengeful Virgin. I picked it up based on Brewer’s name. And as you can see from the original cover and marketing copy, it was one of those lust-and-greed-leads-to-murder tales. But it stands out from so many others because of the snap in Brewer’s style. The book is about Jack Ruxton, who runs a TV sales and repair shop. He makes a housecall one day to the home of Victor Spondell, an old invalid who is being cared for by his eighteen-year-old stepdaughter, Shirley Angela. It doesn’t take long for Jack and Shirley to fall in lust. Then try to figure out a way to murder Victor so Shirley can lay claim to the three-hundred grand he’s left to her. After awhile it was time to eat something again, so I walked down to the drugstore and had a ham sandwich and a glass of milk. It was dark outside. There was some light from the street. Cars went up and down, maybe to parties and good times, or just home to TV and the evening paper. After awhile it was time to eat something again, so I walked down to the drugstore and fooled around with a ham sandwich and a glass of milk. It was dark outside. Neon glowed in the streets. Cars hissed up and down on their way to parties, maybe, good times, or just home to the one-eyed monster, and the evening paper. That right there is the elusive thing called voice. It’s a symbiosis of writer and character rendered with craft on the page. Look at the verbs—fooled around, hissed. And the specific nouns—Neon, one-eyed monster. That’s how Jack Ruxton would talk, pressed through the gauze of a skilled writer’s imagination. Go ahead and use a thesaurus. I wrote this sentence: I ate a hamburger. Just for laughs, I opened my Mac dictionary, entered “eat” and went to the thesaurus. There I found: devour, ingest, partake of; gobble (up/down), bolt (down), wolf (down); swallow, chew, munch, chomp; informal guzzle, nosh, put away, chow down on, tuck into, demolish, dispose of, polish off, pig out on, scarf (down). In about ten seconds I decided on: I demolished a hamburger. The best time to do this, in my experience, is by looking over your previous day’s pages. That’s not the time for major changes in plot or character. Just use it to put some snap in your style. Readers will notice. What is your approach to style? Do you think about it as you write? Is there an author you’d like to emulate (not copy)? This entry was posted in Writing and tagged Gil Brewer, Hard Case Crime, voice by James Scott Bell. Bookmark the permalink. Oh, I remember those spinning wire racks full of pulp fiction! Thank you for the Brewer paragraph example. It was helpful. I don’t often think about style as I write because I’m just trying to get the plot down on the page. But perhaps over time with more practice . . .. I would love to be able to emulate Eurdora Welty for her descriptive passages, Jarret Middleton for the way he can incorporate local dialect throughout a whole book without tiring the reader’s ear, Chaim Potok for his manipulation of sentence structure, and Andy Davidson for his lyrical prose. Priscilla, I think you’ll find the more intimately you know the character (I make us of a Voice Journal for this) the more naturally you’ll produce the style. You’ve got some good names there to emulate. I’ve found my voice appears when the words flow, when I’m not thinking about *writing*. Yes, I go back and punch things up–more than once–but when my characters take the reins, that’s when my voice hits the page. My first pass is when I print out the most recent chapter and read it in bed, circling words that need more oomph. Suzanne Brockmann’s voice is one I can identify with. Also JD Robb, although I wouldn’t say my writing compares with either of them. But it’s their characters on the page, not them. My log-in page has a “Remember me” checkbox under the password block. Mine used to, but it’s gone. Technology and I don’t get along. Perfect timing on this topic. I just received a contest critique that I needed to put more snap in my [third-person] narrator. “Make the language sizzle and pop,” it said. And the only how-to was to make the narrator have a stronger personality. In a close-third person, i didn’t think the narrator was supposed to separate from the character’s voice and draw attention to herself. Am I mistaken? Nancy, you’re right about that. Unless it’s that rare book where the author’s voice is a showpiece (like with The Hitchhiker’s Guide to the Galaxy) the third-person narration should sound like the character. What adds “sizzle and pop,” though, is the author filtering hotter emotions via sense memory and the like (I wrote a book on Voice that goes into all this). Maybe look at going a bit deeper in those emotional moments. Also, give us some surprises with the character, things the reader would not expect, yet are justified. Thanks for the post. Perfect timing, as I’m finishing editing my WIP. Your book on Voice was very helpful. Another book, was one you recommended when I asked for suggestions for books to add some literary techniques – Word Painting, by Rebecca McClanahan. My approach to style is an extensive voice journal, getting into the head of my MC, and seeing and hearing what he sees, thinks, and says – poor grammar, colloquialism, and all. That’s the way to go, Steve. Style/Voice is one of the seven critical success factors of fiction, and attention must be paid (to quote Death of a Salesman…and why I’m quoting Death of a Salesman on this matter I’ll never know). The author whose snappy voice immediately comes to mind is Raymond Chandler. Of all the variations on POV, first person seems to lend itself most naturally to a voice full of attitude, personality, world view, and snap. Highly recommend your book VOICE which is full of great tips to add snap. Thanks for the shout out, Debbie. And of course Chandler is one of the grand masters of this, and I never got the feeling he was straining for effect. I know he worked hard on his style, to find just the right balance. I can turn to any Chandler page at random and be delighted. Great advice but I do approach it with a bit of caution. Used judiciously, organicly, it’s fantastic. But when it’s done badly, it’s a very bad thing called “author trying to be cutesie”. I recently finished reading a book that evidently was popular enough to become a movie a few years back (though I don’t even remember hearing about it). The book was engaging enough to get me to finish it, thanks to the characters & despite the author, but throughout the book that author worked overtime to find ways not to say simple things like “the sky was blue” etc. To say it was excessive is understatement. As a result, I would never read that author again. If your snap takes your attention from the story to focus on the author, it isn’t apleasant experience for the reader. Perhaps it’s the “cutesie genre” itself which rankles, BK. (See Elaine’s post on the subject). But your cautionary note is apt. Keep consistent with the character AND with the moment. As I’ve written elsewhere: Don’t write to impress your readers; write to distress your characters. For clarification, it wasn’t one of the cutesie genre of stories. It was definitely the author’s overuse of the technique. Style is something I’m working on improving. I’ve spent so much time focused on story and structure. My late editor Mary put me through an intense voice edit of my first published novel, Empowered: Agent, which really opened my eyes to voice and style. But it’s a never ending process. One thing I’ve learned is the importance of the character’s attitude on their voice and the style of writing. I think about style a lot as I draft, but I mainly revise for it in the second draft. As for writers that I want to emulate–there are so many great ones, aren’t there? Robert Parker and Elmore Leonard are two that have inspired me in their styles. Dale, you brought up attitude, which is something I teach, especially re: First Person POV. Definitely an essential. Parker and Leonard, two greats! If there’s one writer’s voice I wish I could emulate, it’s Stephen King. He does close third-person better than anyone, I think. His writing is so easy and conversational, he creates a kind of ear worm that seamlessly transfers spots on the page to pictures in my head. It’s his character work that is the secret here, I think. His ability to craft the narration through that unique sound. He also creates different sounds in his First Person narrators. Just compare The Body (Stand by Me) with Shawshank, etc. Masterful. I realize that voice is thought of as the way a writer writes, that it emerges in some magical way that you have no control over. Hog wash. I think that voice is better with it isn’t a one size fits all characters and it shouldn’t be only part of the writer. Make it part of the character, not just decorations on a Christmas tree. I try to start with an interesting character, someone a little off the wall with good reasons. My first interesting character was a depressed werewolf. Get to know that character, really know them, then get out of the way to let them speak and act. They must have their own voice. Think of how different Miss Marple and Hercule Poirot are. Both are great personalities and yes you can tell it’s Agatha Christie’s writing. I’m arguing that it can be more. Chandler used an interesting main character (a slumming angel) and gave him snappy dialogue to show a range of behavior. Mickey Spillane did the same. And Dashell Hammit was a pioneer. If the writer had snappy dialogue coming from all of the characters would have been — well, dull. I see writing as having deeper and deeper layers. I try to go deeper. Do I know what I’m talking about? I have no idea. That is for others decide. Brian, you do indeed know what you’re talking about. And your take on voice is precisely the one I have in my book. It’s a symbiosis. It’s a mistake to say the “author” (alone) has a voice (in most cases)…if they’re truly telling the story. I’ve got to reread your book on Voice. This is something with which I have no issue. The “voice” of James M. Cain, the dialogue, the story drew me in. It did the same for Jim Thompson and Elmore Leonard I’ve been reading and lately been reading some Lawrence Block (who is still with us thankfully) & I like the voice there too. Matthew Scudder books! I also read a fine book on VOICE, called VOICE, by a man with the initials JSB. I had been thinking the other day I need to re-read as a refresher. Thanks for the reminder Jim and for the suggestion of another noir writer – the check (cheque) is in the mail. Thanks for the good word, Craig!